Lund University, located in southern Sweden, has done it again. It has once again been ranked among the world's top 100 universities in 2012 by QS World University Rankings. I first learned of Lund University while studying law at the Bachelors level at University of Buea, Cameroon and looking for opportunities to further my education abroad. I was privileged a few years later to be admitted to pursue a Masters degree (LL.M.) in International Human Rights Law and International Labour Rights at the revered Lund University - an institution that has been repeatedly ranked among the world's top universities in recent years by different ranking bodies. Lund University was, for instance, ranked among the world's top ranking university in 2009 by QS World University Rankings. The university has enjoyed high rankings in many subject areas including Arts and Humanities, Natural Sciences, Engineering and Technology, Life Sciences and Medicine, Accounting and Finance, Sociology, Politics and International Studies, as well as Law. QS World University Rankings by Subject 2012 placed Lund University among top 100 universities in the world in subject areas including Law, Politics and International Studies, Accounting and Finance, and Mechanical Engineering. According to QS World University Rankings 2012, Lund University is among the best (top 50) universities in the world in other subject areas such as Geography (20th), Environmental Science (43rd =) and Civil Engineering (47th). 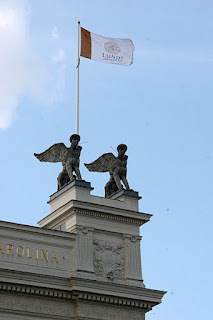 Lund University is my alma mater and I am definitely proud and honored to have studied at Lund. Congratulations to all those working tirelessly to make Lund University a top tier institution of higher learning. Read My Journey to Lund, Sweden - a Life-changing experience.